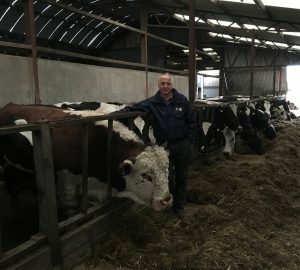 Just prior to the forthcoming Northern Ireland Hereford Breeder’s Association show and Sale of 17 Bulls this Easter Tuesday Ivan Haire the Honorary Secretary caught up with local Co Antrim Dairy Farmer Brian Mawhinney at his farm just outside Doagh to find out why he choose a Hereford Bull to progress the suckler side of the business. 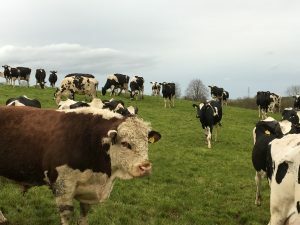 Established in 1982 the Laurelhill herd of pedigree Holsteins is well know for producing quality animals with the famed Laurelhill Fay being one of many. 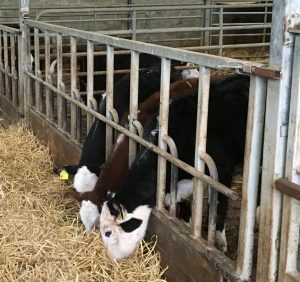 After a reduction sale in 2013 Brian still milks on average 50 head and is using a Pedegree Hereford Bull to build up a suckler herd. Anyone interested in the Hereford breed should contact the Associations Secretary Ivan Haire on 07887 675649, or come along to the forthcoming Show and Sale of 17 Bulls in conjunction with the Native Breed’s on Tuesday 18th April 2017 at Dungannon Market. Show commences at 11am with sale at 1pm.